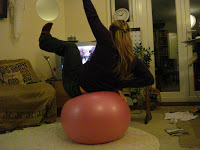 I bought a pink pilates ball. I blew it up and put it in front of the TV. The idea is that when I am watching endless amounts of mind numbing, soul zapping ,flab spreading, wibbling, rubbish; honing the shortness of my attention span and ensuring all my ethics, polices and global current affairs come filtered through the glib, greedy, greasy saturated fat of pressurised media methodology…any way when I am doing that..I get to work my core muscles at the same time. I will be an empty shell but the shell will have good abs. 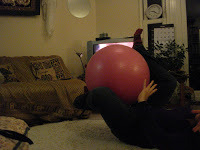 However…..what I actually do best on that Pilates ball is eat vast quantities of stir-fry bouncing idly and whooping at the Daily Show. I can eat twice my body weight because the bouncing seems to ease the food down. be very careful those things are dangerous. Especially after wine. I fell off one last year and put my knee through a glass bookshelf. I’m still paying for the bloody hospital bills. That is THE BEST post I’ve read all day, I love it! 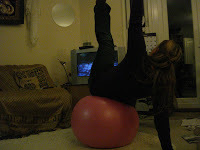 Exercise and I were never friends, but I keep trying. Good grief Tam! I will ensure I keep mine sedated. Ta for the heads up! Good grief……..shouts of laughter here in Oz at 6.30am. Haha. Great post. Yes, don’t do what Tam did. She now has an impressive scar that looks like a shark bite. Maybe you could sew little horns on and you could bounce around your flat? Remember those things? another great post – thanks! OMG this is so perfect. Made me laugh out loud. And I needed a good laugh. Thank you!! I love the pics. 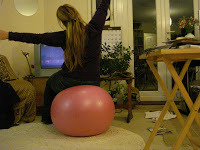 I have one too it groans when I sit on it. You are too much fun! Am laughing my head off over here in Canada! Just what I needed, things were getting far to serious over here. eh eh eh! I love the pictures! Made me smile.